Since I was choosing my color palette this week, I thought I would share my little (unconventional) method for how I choose a color palette. 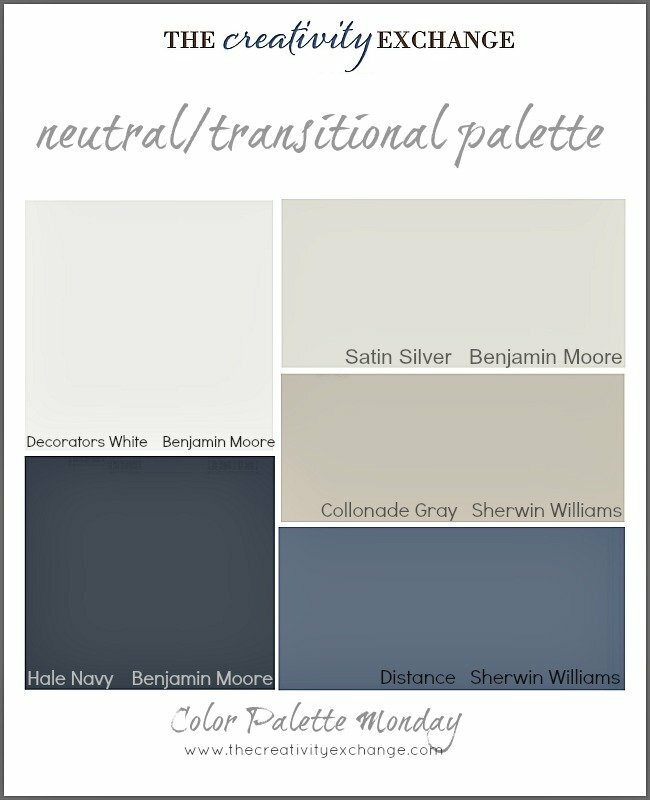 I know that choosing paint colors can be overwhelming (too many amazing choices), which is why I started using a few little tricks to help me pick my color palette. **You can see how this space turned out here. (As a reminder, each color palette that I share is printable. It makes a huge difference to look at paint colors that have been printed out on paper, versus your computer monitor. 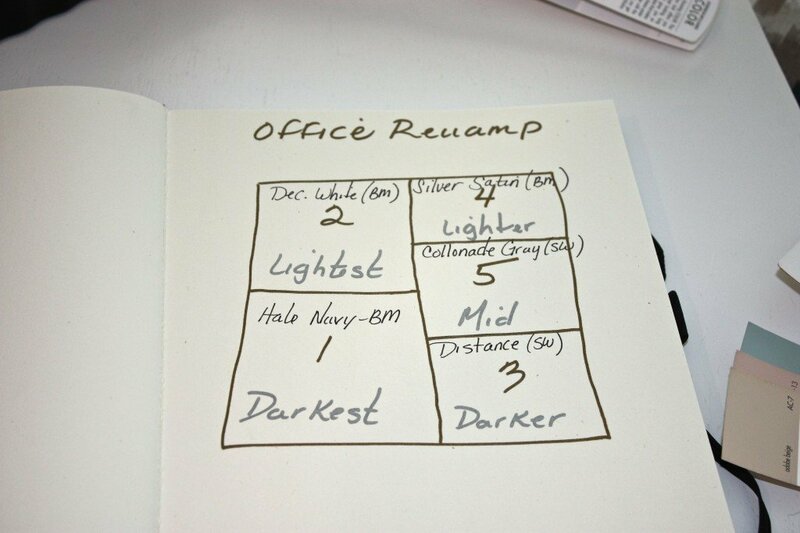 It helps even more if you print out the palettes on smooth white card stock. My palettes should not be used to replace a paint color card, so if you see a color you like, please refer to a paint color card). 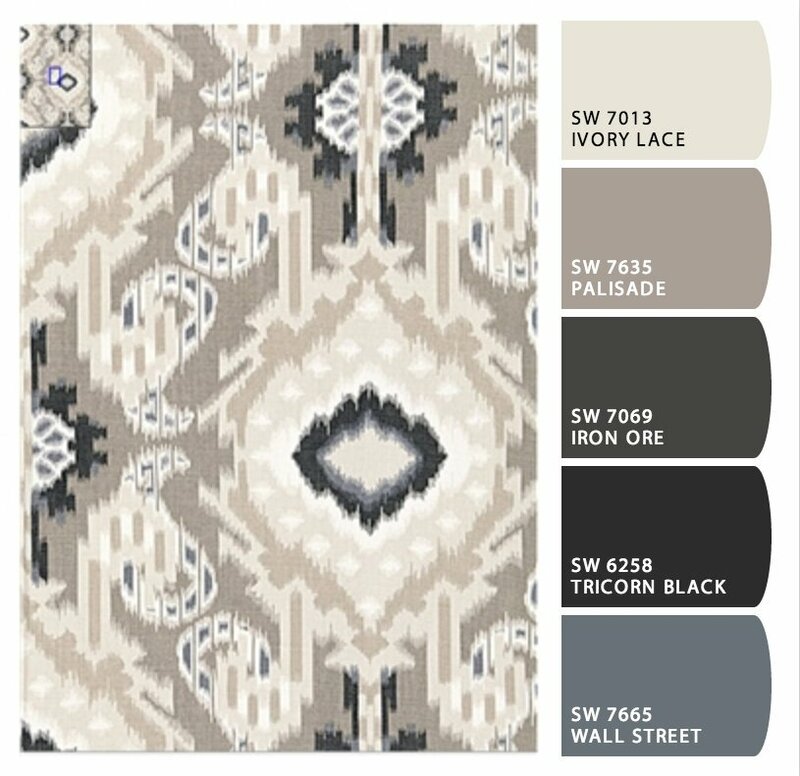 This week’s palette is a nice neutral/transitional palette and these also happen to be the colors that I have settled on for our revamp project. The minute I saw this fabric, I knew this would be my color inspiration for the space. The beautiful neutral mix of cool and warm tones is exactly what I have been dreaming of in this space. 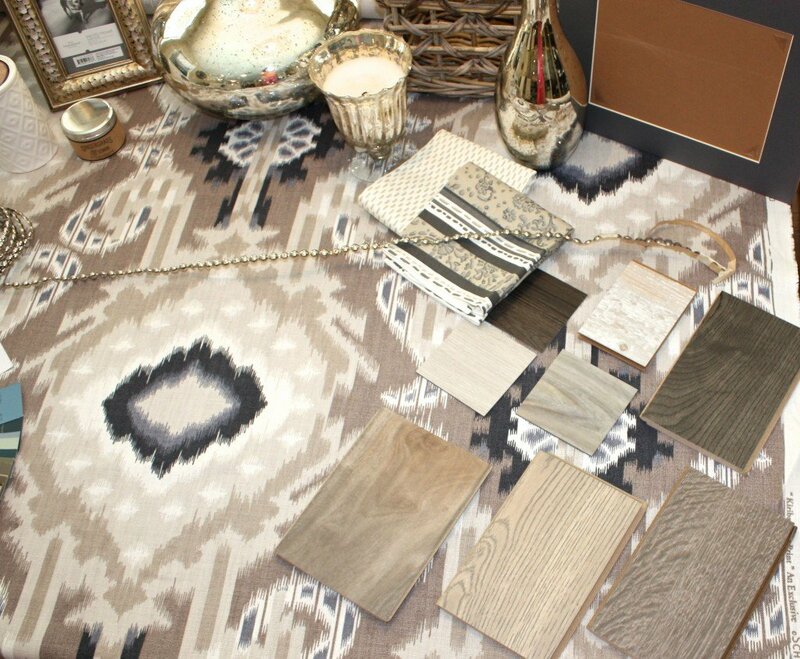 My goal for my office is to design a space around beautiful gray washed wide planked flooring and this fabric and color palette will really play off of the flooring. It’s amazing how undertones seem to pop right out when everything is laid out together and how much easier it is to zone in on perfect paint colors when you have all your inspiration together. 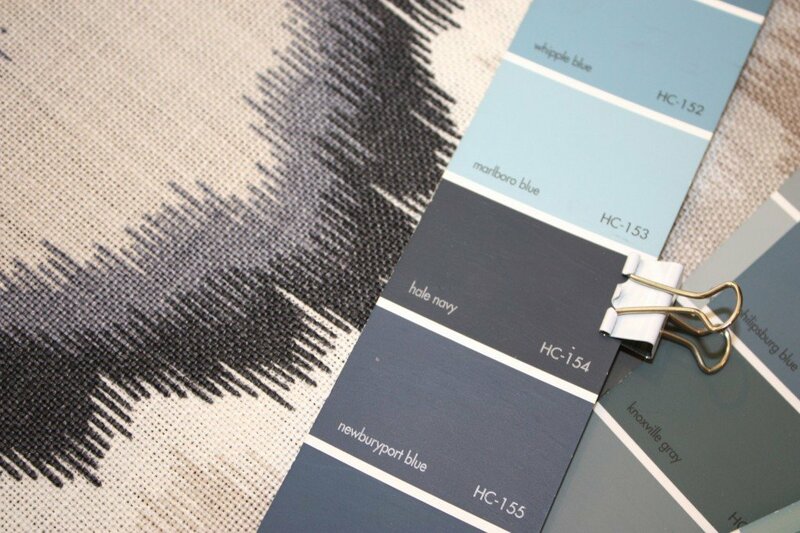 I like to choose at least four to five colors and while I’m not going to paint five different colors, the palette will be my guide as I pick out fabrics, paint finishes, furniture and accents. 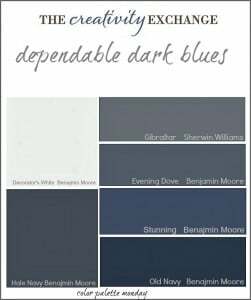 I always choose my darkest color first (the anchor), second I pick my lightest (trim and ceiling color), a darker and lighter color I pick third and fourth. I leave my mid shade color for the last. The mid-shade pulls the palette together (I have numbered my little order in grid above). While the colors that come up in “Chip It” may not be your final choices, it’s a great first place to help you get started because you can run by Sherwin Williams and pick up the cards around these colors. (By the way, I LOVED the colors that came back from Chip It but I wanted to go more blue than the black). 5) I pick my lightest shade next, and this will be the lightest color in my palette and chances are my trim color and possibly my ceiling color. Because I’m going to be buying tons of pre-made shelving and desks in white from Ikea, I want to match this color to the Ikea pieces. For now, I picked Decorators White by Benjamin Moore but this color will be tweaked once I get my Ikea pieces. 6) Next, I pick a darker and lighter color from my fabric inspiration. Lastly, I pick my mid shade color last, which was easy (this time) because the mid shade is the dominent color in the fabric. I decided on Collonade by Sherwin Williams. I always choose paint colors by laying paint cards in color order so I can see the undertones better. Last year, I did a post on how to lay out the cards and zone in on specific undertones here if you’re interested. 7) Lastly, I laid out everything in our playroom with the lighting to double check my color choices and everything looked great. I then picked up samples of each color and painted them on poster board and double checked my colors. Everything was great and I’m good to move on and order my fabulous floors and furniture this week! I hope this will help someone out there who is starting from scratch to create a beautiful palette. 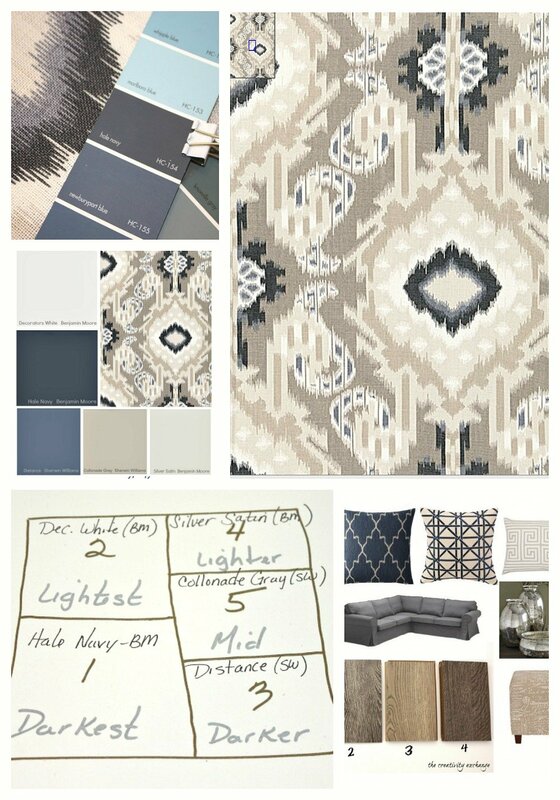 Of course this will not be the end color palette of the space because I will have to tweak as I buy furniture but it will be very similar. 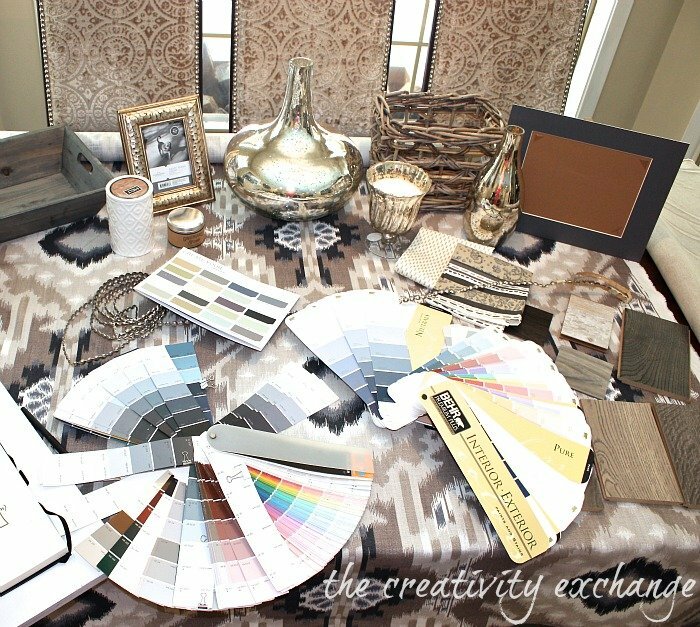 So what do you think of my “dream” office color palette? I would love to hear your thoughts! If this is your first time visiting Color Palette Monday, you can go back and see the previous featured palettes by clicking the here. « How to Print Monogram Printables on Fabric (DIY Framed Pin Cushions)..
What a fantastic palette and beautiful fabric! Oh so timely, as I have been using this method for my husband’s office redo. I have found some gorgeous fabrics as my starting point, and have been searching for The Perfect Gray to go with them. I finally made the leap and bought the paint today! Can’t wait to get it up on the walls. Your space is going to be amazing! I love the navy in that fabric – so classic and timeless! Can’t wait to see it all come together – what an exciting project! Thank you Jenny! I cannot wait to get it done so I can finally have a little spot of my own! 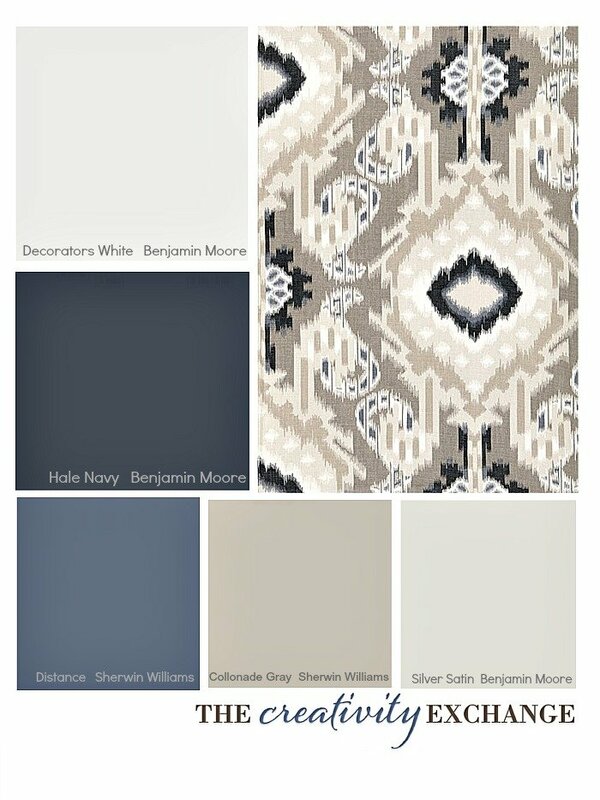 Have you looked at Chelsea Gray by BM or Timberwolf? Those are two amazing grays that look great in almost any space. However, they are a little dark. I can’t wait to see what you’re going to do in hubby’s office. I know what ever you do will be off the charts amazing! I love this palette! The fabric choice is a great one. Currently I am obsessed with the Covington Bosporus fabric in Flax for my bedroom, but am having so much trouble zero-ing in on colors! That and a little (lot) of procrastination! I’ll have to try your method! I can’t wait to watch the evolution of your new space! I just pulled up your fabric Kathleen and you’re right, hard colors to match. Is that a greenish accent color? I would upload it into chip it and see what it picks up. That green-blue would be a beautiful wall color! I can’t wait to see what you come up with Kathleen! Thanks girl for stopping by! Thank you Megan! I can’t wait to pull it all together! We have just started the big stuff today and ordering the floors in the next couple pf days. It wil be so nice to have all of our craft stuff and paints in one place! Thanks girl! Fantastic color palette. Love the fabric. I’m making my first foray into painting myself. So glad I found you and this post. Do you have a final picture of how everything turned out. 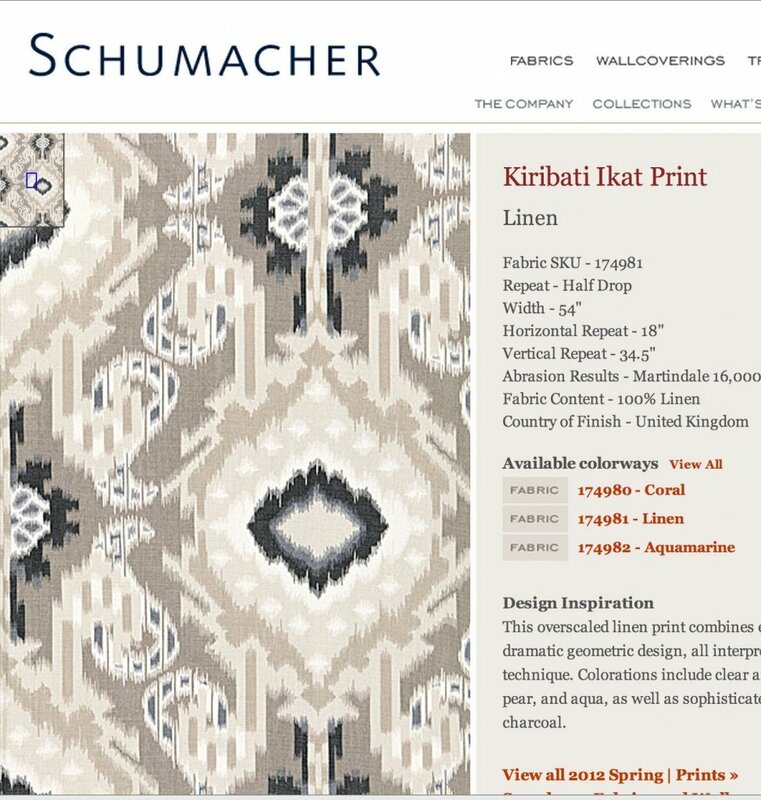 We are using the Kiribati Ikat print in our living room for drapes and am trying to pick a good fabric to pair it with for pillows. Any suggestions? Hello. I would love to see the finished space.